NB: talks begin the Saturday before Ash Wednesday. Our first guest speaker will be Fr James Hanvey, S.J. 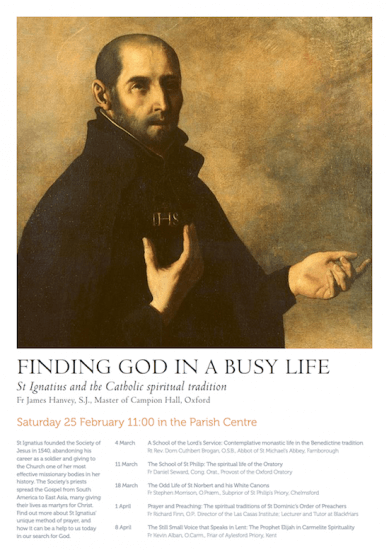 , Master of Campion Hall, Oxford, on Finding God in a busy life: St Ignatius and the Catholic spiritual tradition. St Ignatius founded the Society of Jesus in 1540, abandoning his career as a soldier and giving to the Church one of her most effective missionary bodies in her history. The Society’s priests spread the Gospel from South America to East Asia, many giving their lives as martyrs for Christ. Find out more about St Ignatius’ unique method of prayer, and how it can be a help to us today in our search for God.